Interactive Quiz in Two Steps ! 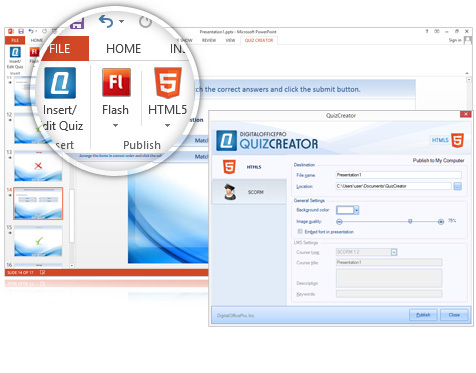 Easily create interactive HTML5 / Flash Quizzes from within Microsoft PowerPoint. 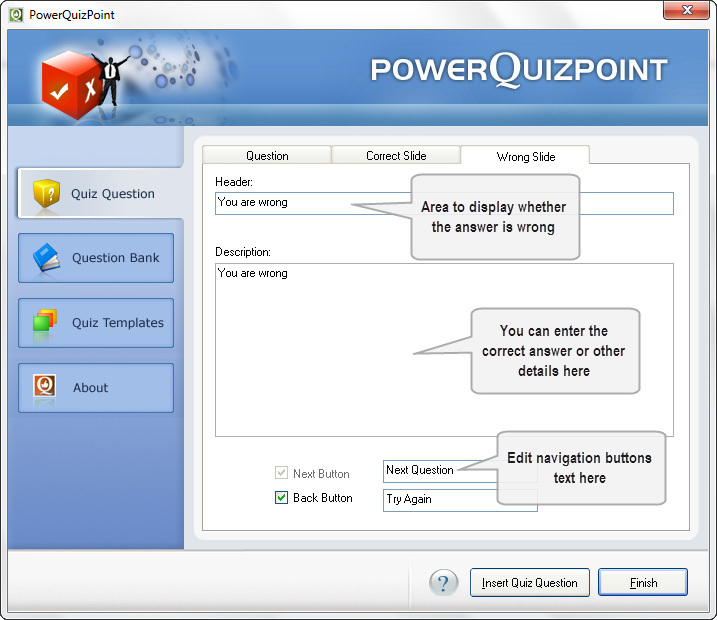 With PowerQuizPoint Quiz Creator you can insert interactive Quiz slides directly into your PowerPoint presentations and Publish them to HTML5 or Adobe Flash format. Your Question, Choices & Correct/Incorrect response. Thats all. Ability to store and retrieve your questions for future use. Saves time. Track quiz results of all candidates via email. 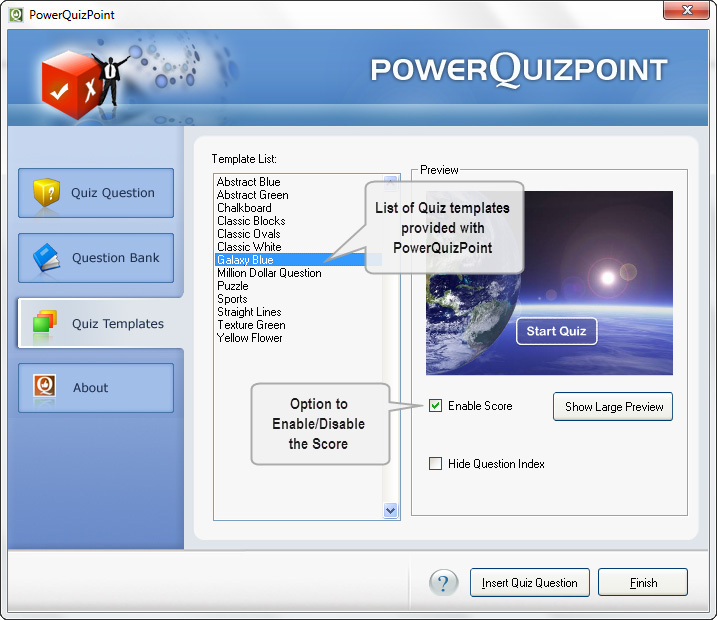 According to eLearning experts, PowerQuizPoint Quiz Maker is by far the easiest and more featured alternatives that let to you create a quiz without any programming abilities. Such quizzes can be used within a website or a presentation. 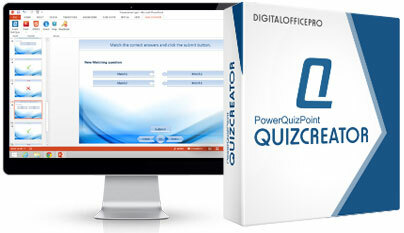 Here is a step by step demonstration on how to create a quiz with PowerQuizPoint. Follow these steps to get started with creating your first quiz in Quiz Maker. Once you download the installer, run the setup routine and follow the instructions. If you are using PowerPoint 2013/2010/2007, you'll find a PowerQuizPoint tab on the Ribbon. In the case of XP/2003 you will see PowerQuizPoint buttons on PowerPoint interface. After finishing insertion of question you can view the quiz either by clicking "View Show" or using F5 Hot Key in PowerPoint or by publishing the inserted quiz in Macromedia Flash format. Publishing is done by clicking the publish button provided on the ribbon and it takes only a few minutes for PowerQuizPoint to publish the same. Once Publishing is done, you will have options to save your quiz in the format you would prefer to use. Now that publishing is done, it's time to share your quiz with rest of the world. 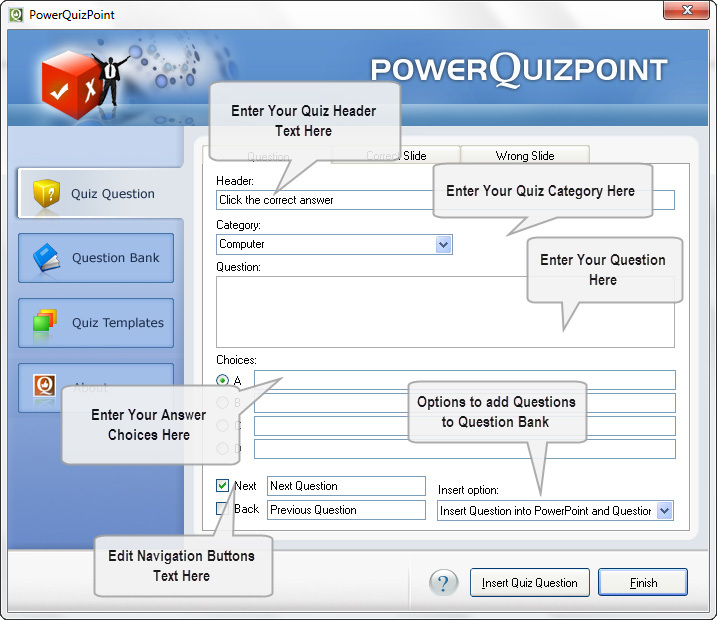 PowerQuizPoint output comes in web friendly Flash format which can be uploaded to your website, shared via popular networking sites like Facebook, Twitter etc. It is a great way to engage your visitors with an effective, highly functional, user friendly and aesthetically designed assessment tool which will make you stand out from the rest. G. Insertion option: Here you are provided with three choices. A. Header Text.Like "Yes, you are absolutely right"
B. Message box which allows you to pass on any extra info regarding the question. Once you are done with filling all these fields you need to move on to "Wrong Slide"
A. Header Text.Like "Sorry , you have chosen an incorrect answer"
B. Message box which allows you provide the right answer for that question. Once you are done with this, you can insert this question by clicking on the "Insert Quiz Question Option" Now you can see that the question is being inserted to PowerPoint. You need to repeat this procedure for inserting your desired no of questions for you quiz. After this you need to click finish button. To Publish the Quiz in Flash Format please follow the steps given below. 1. Click "Publish Quiz" button from the PowerQuizPoint tool bar. It will pop up a dialog. 2. Once Publishing is done, you will have two options to save the quiz. "Save as swf" and "Save as Exe". Select the option of your choice. 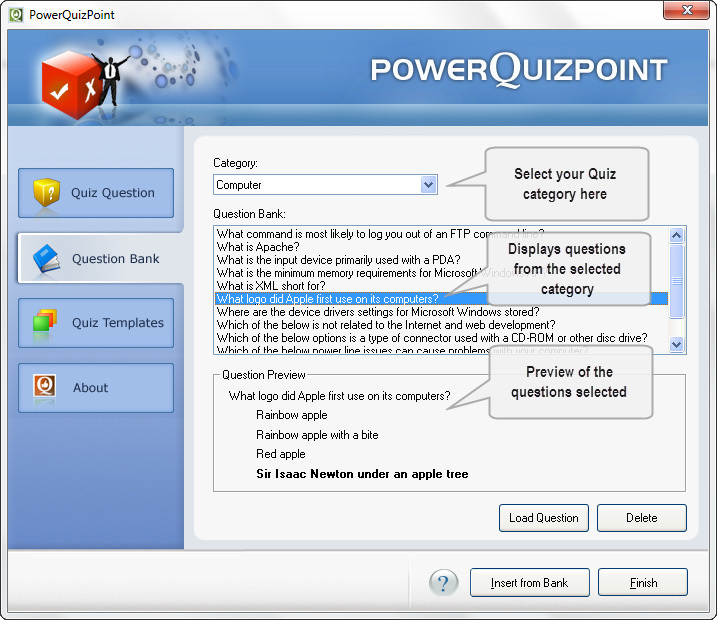 PowerQuizPoint provides you with an option for saving the questions (category wise) in a question bank. It even preserves the format of the text also. Users can edit the question by selecting "Load Question" button as in the dialog shown above. An option to delete a question is also provided here. PowerQuizPoint provides users an option to select mind-blowing quiz templates from its gallery. They are designed specifically to suit different needs. Also, once inserted into PowerPoint, users can even change the look and feel of the template according to their skills. 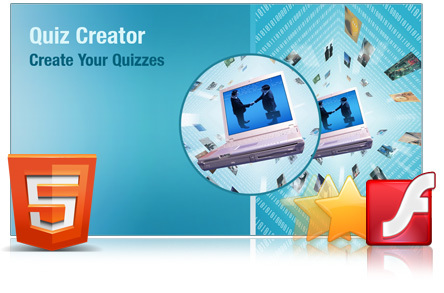 This is an option which no other quiz creator available in the market provides. PowerQuizPoint provides users an option to select mindblowing quiz templates from its gallery. They are designed specifically to suit different needs.